A process is disclosed for modifying a parent ligand by attaching to the parent ligand a conjugation agent that is reactive with a moiety of a target receptor to which the parent ligand binds such that a covalent bond is formable between the conjugation agent and the receptor moiety. Also disclosed are compositions, probes and methods of detecting and/or quantifying receptors using the modified ligands of the invention. This application claims priority to U.S. Provisional Patent Application Ser. No. 60/178,756, filed Jan. 28, 2000, the disclosure of which is incorporated herein by reference in its entirety. Many inhibitors of acetylcholinesterase react covalently with this enzyme to form an acyl enzyme that deacylates more slowly than the acetyl enzyme formed with the natural substrate acetylcholine. The acetyl enzyme forms rapidly by attack of the active site serine on the substrate. Transfer of the acyl group to the enzyme occurs through a tetrahedral intermediate. The acetyl enzyme is rapidly hydrolyzed, with a half time of 10 μsec. These rapid acylation and deacylation steps give rise to a turnover rate of 10 5 substrate molecules per enzyme molecule per second. Cholinesterase inhibitors such as physostigmine and neostiginine form methylaminocarbamyol and dimethylaminocarbamoyl enzymes, which have half times for deacylation of several minutes. Thus, by providing the enzyme with an alternative substrate, catalysis of acetylcholine is precluded during the catalytic cycle for the carbamoylating agent. The kinetic constants for the respective acylation steps for the acetoxy and carbamoxy ester substrates do not greatly differ; hence the longer residence time of the carbamoyl enzyme conjugate is an important factor in favoring inhibition. Several other enzymes are inhibited by covalent attachment of the inhibitor, giving rise to irreversibility. The hydrazines (phenelzine, isocarxazid metabolites) and the acetylenic agents (pargyline) are oxidized to reactive intermediates by monoamine oxidase. These intermediates attack the associated flavin cofactor on the enzyme Such agents have been termed suicide substrates since their activation requires catalysis by the very enzyme that they inactivate. Hence the inactivation process is mechanism-based. There are now many examples of such substrates, activation of which by the enzyme results in covalent modification of the enzyme or of an associated cofactor. Often this occurs by conjugation or association of the enzyme with its substrate followed by a neighboring group attack. Several of the targets of suicide substrates have therapeutic significance. These include the penicillinases and alanine racemases in antibacterial design; GABA transaminase inhibitors for antiepileptic agents; lipoxygenase and cyclooxygenase inhibitors to control leukotriene and prostaglandin biosynthesis, respectively; aromatase inhibitors to block formation of estrogenic hormones; ornithine decarboxylase inhibitors as antiparasitic agents; and dopamine β-hydroxylase inhibitors to control catecholamine biosynthesis. Many suicide substrates serve as antimetabolites and are potential antineoplastic agents. The effectiveness of these inhibitors depends not only on their relative dissociation constants or K m values compared with those of the endogenous substrate but also on kinetic competition between turnover of the suicide substrate and the inactivation event. Omeprazole (PRILOSEC) is another well-known irreversible binding drug that has been released for clinical use. This drug inhibits gastric acid secretion by binding to the H +, K+-ATPase present only in the apical membrane of parietal cells. Omeprazole is especially useful in patients with hypergastrinemia and may be valuable in those whose peptic ulcer disease is not well controlled by H2 antagonists. Omeprazole contains a sulfinyl group in a bridge between substituted benzimidazole and pyridine rings. At neutral pH, this drug is a chemically stable, lipid-soluble, weak base that is devoid of inhibitory activity. This neutral weak base reaches parietal cells from the blood and diffuses into the secretory canaliculi, where the drug becomes protonated and thereby trapped. Protonated drug rearranges to form a sulfenic acid and a sulfenamide. The sulfenamide interacts covalently with sulfhydryl group at critical sites in the extracellular (luminal) domain of the membrane-spanning H+, K+-ATPase. Omeprazole must thus be considered as prodrug that needs to be activated to be effective. R 1 is an optional spacer which preferably comprises a non-hydrolysable radical selected from the group consisting of alkyl, heteroalkyl, cycloalkyl, heterocycloalkyl, oxoalkyl, heterooxoalkyl, alkenyl, hetero alkenyl, aralkyl, hetero aralkyl, aryl and heteroaryl radicals. wherein A is N-maleimide, 2-pyridyldithio, or halogen; X is NH, S, or O; Y is H, halogen, NH 2, or O; Z is H, halogen, or CH3; R1 is spacer arm comprising a non-hydrolysable radical preferably under physiological conditions; R2 is H, β-D-ribose, β-D-2-deoxyribose, or their 5′-mono-, 5′ di-, and 5′ tri-phosphate. wherein R 5 is 4-carbonyl-α-methyl-α-toluene, 6-[α-methyl-α-tuloamido]-hexanoate, N-[3-propionate], or 6-[3′-propioamido]hexanoate. wherein A is a conjugation agent that is reactive with a moiety of the target receptor to which the parent ligand binds, such that when said parent ligand binds to the receptor a covalent bond is formed between said conjugation agent and said moiety; and R 1 is an optional spacer. wherein A is a conjugation agent that is reactive with a sulfhydryl group of said target receptor to which the parent ligand binds, such that when said parent ligand binds to the receptor a covalent bond is formed between said conjugation agent and said sulfhydryl group of said receptor; and R 1 is an optional spacer. The disclosure of all patents, patent applications, publications and published patent applications referred to herein are incorporated herein by reference in their entirety. FIG. 1 shows the NEM inhibition of equilibrative  3H-uridine transport in murine myeloma SP2/0-Ag14 cells. FIG. 2 shows the effects of NEM on the kinetics of  3H-NBMPR equilibrium binding in murine myeloma SP2/0-Ag14 cells. FIG. 6 shows the inhibition of  3H-NBMPR binding by CrMCC, cytidine and SMCC in human HL-60 promyelocytic leukemia plasma membranes. FIG. 7 shows the effect of CrMCC on the kinetics of  3H-NBMPR binding to human HL-60 promyelocytic leukemia plasma membranes. FIG. 9 shows the time course of  3H-CrMCC binding to human HL-60 promyelocytic leukemia plasma membranes. FIG. 10 shows the dissociation of  3H-CrMCC and 3H-cytidine from the binding sites of human HL-60 promyelocytic leukemia plasma membranes. FIG. 11 shows the concentration dependence of  3H-CrMCC binding to human HL-60 promyelocytic leukemia plasma membranes. FIG. 12 shows the effect of pH on the dissociation of  3H-CrMCC from its binding site in human HL-60 promyelocytic leukemia plasma membranes. FIG. 13 shows the inhibition of 3H-CrMCC binding to human HL-60 promyelocytic leukemia plasma membranes. FIG. 14 shows the covalent binding of sulfhydryl reactive  3H-cytidine analogs to human HL-60 promyelocytic leukemia plasma membranes. FIG. 17 shows the covalent binding of sulfhydryl group reactive  3H-adenosine analogs to human HL-60 promyelocytic leukemia plasma membranes. FIG. 18 shows the inhibition of  3H-5-HT binding to murine brain membranes by various 5-HT analogs. FIG. 19 a shows the chemical structure of LBT3001 (1-[2-(5-hydroxy-1H-indol-3-yl)-ethyl]-pyrrole-2,5-dione)). FIG. 19 b shows the reaction scheme for synthesis of LBT3001. FIG. 20 a shows the chemical structure of LBT3002 (4-(2,5-dioxo-2,5-dihydro-pyrrol-1-yl)-N-[2-(5-hydroxyl-1 H-indol-3-yl)-ethyl]-butyramide). FIG. 20 b shows the reaction scheme for synthesis of LBT3002. FIG. 21 a shows chemical structure of LBT3004 (3-(2,5-dioxo-2,5-dihydro-pyrrol -1-yl)-N-[2-(5-hydroxyl-1 H-indol-3-yl)-ethyl]-propionamide). FIG. 21 b shows the reaction scheme for synthesis of LBT3004. FIG. 22 a shows the chemical structure of LBT3005 (4-(2,5-dioxo-2,5-dihydro-pyrrol-1-yl-methyl)-cyclohexane carboxylic acid [2-(5-hydroxy-1 H-indol-3-yl)-ethyl]-amide). FIG. 22 b shows the reaction scheme for synthesis of LBT3005. Parent ligands that can be modified include ligands that are interactive with es nucleoside transporter and/or nucleoside/nucleotide/nucleobase-sensitive proteins. Two forms of nucleoside transporters are classified based on their sensitivity to inhibition by NBMPR (nitrobenzylthioinosine). See Griffith et al.,  Biochim. Biophys. Acta, vol. 1286, pp. 153-181 (1996). The group of transporters sensitive to NBMPR is designated es (equilibrium sensitive), and the group insensitive is designated ei (equilibrium insensitive). In one embodiment, compounds are provided that have differential binding to es vs. ei receptors. Compounds are provided that bind selectively and irreversibly to es receptors. The expression of es receptors is positively correlated with the carcinogenic state of cells. Among the numerous reactive functional amino acid side chains on the es nucleoside transporter proteins that can be used for covalent attachment, the sulfhydryl group of cysteine residue is probably the most pharmacological and biologically important. Early studies on the effect of sulfhydryl reagents on nucleoside transport in mammalian cells had shown to cause a marked inhibition of uridine uptake in a variety of cultured cells (Plagemann & Richey (1974),  Biochim. Biophs. Acta, vol. 344, pp. 263-305; Plagemann et al. (1978), J Cell. Physiol., vol. 97, pp. 49-72; Plagemann & Wohlhueter (1980), Curr. Top. Membr. Transp., vol. 14, pp. 225-230; Belt (1983), Biochem. Biophys. Res. Commun., vol. 110, pp. 417-423; Belt (1983), Mol. Pharmacol., vol. 24, pp. 479-484). However most of the earlier studies were directed toward the total nucleoside uptake and little attempt were made to distinguish the differential in sensitivity towards sulfhydryl reagents by the es and ei transport systems. Furthermore, the sulfhydryl reagents used were mainly of organomercurial compounds, which were demonstrated to perturb plasma structure at concentration as low as 200 μM (Belt & Noel (1985), Biochem. J., vol. 232, pp.681-688). Ligands also may be modified which are ligands that bind to serotonin (5-hydroxytryptamine, or 5-HT) receptors. 5-HT receptors include a diversity of receptor subtypes (Peroutka, S. J.,  CNS Drugs, (1995), vol. 4 (Suppl 1), pp. 18-28). With the exception of the 5-HT3 receptor, which is an ion channel (Derkash, V. et. al., Nature, (1989), vol. 339, pp. 706-709), other 5-HT receptors belong to the extensive family of seven transmembrane G protein-coupled receptors. The clinical significance of the effects of 5-HT is manifest for example, in neurological, CNS, psychiatric and mood disorders, including migraine, anxiety, depression, schizophrenia, obsessive compulsive disorder, psychosis, aggression, hostility, eating disorders, gastrointestinal disorders, hypertension, the maintenance of the circadian rhythms in the sleep-wakefulness cycle, sexual activity, compulsive behavior, temperature, emesis, and cardiovascular and motor function. Drugs that target the 5-HT receptors thus have wide clinical applications. Ligands that bind to 5-HT receptors can have effects by binding, for example, to the cardiovascular system, platelets, gastrointestinal tract, and the brain (Erspamer, V., Ed. “5-Hydroxytryptamine and Related Indolealklylamines”, Handbuch der Expermentellen Pharmakologie, Vol. 19. Springer-Verlag, Berlin, (1996), pp. 132-181). Thus, for example, the ligand 5-HT may be modified as disclosed herein. Other ligands that can be modified include 5-HT precursors and 5-HT receptor agonists and antagonists known in the art. Examples include the precursor 5-hydroxytryptophan, which has been used as an antidepressant drug; 5-HT 1A-agonists used as tranquilizers and antihypertensives; sumatriptan, a selective 5-HT1 receptor agonist, used for migraine; 5-HT2-antagonists such as methysergide, used for migraine prophylaxis and in carcinoid tumour syndrome; 5-HT2-antagonists such as ketaserin, used to lower the blood pressure in hypertensive patients; and selective 5-HT3-antagonists used to treat cytostatic- and radiation-induced emesis. (Beasley, CM., et. al., Psychopharmacology, (1992), vol. 107, pp. 1-10; Bolden-Watson, C., and Richelson, E., Life Sciences, (1993), vol. 52, pp. 1023-1029.; Koe, B. K., J Clin. Psychiatry, (1990), vol. 51, pp. 13-17). Serotonin binding ligands which can be modifed include those developed for CNS disorders, such as anxiety, such as benzodiazepines, or 5-HT 1A agonists, such as buspirone, gepirone, ipsapirone, and flesinoxan. As anxiolytic agents, they possess advantages over benzodiazepines because they lack the sedation and drug dependence liabilities of bezodiazepines (Barrett, J. E., and Vanover, K. E., Psychopharmacology, (1993), vol. 112, pp. 1-12.). Other serotonin binding ligands include those developed for treatment of depression, such as SSRIs, for example fluoxetine. SSRIs have also been shown to have efficacy in the treatment of bulimia and obsessive-compulsive disorders and may be also useful in treating obesity, panic disorders, premenstrual syndrome, diabetic neuropathy, chronic pain, and certain cognitive aspects of Alzheimer's disease. Other useful antidepressant drugs which are relatively potent antagonists at 5-HT2 receptors, include tricyclic antidepressants, such as trazadone and nefazodone (Cowen, P. J., and Anderson. I. M, “5-Hydroxytryptamine in Psychiatry” (Sandler, M., Coppen, A., & Harnett, S. Eds. ), Oxford University Press, New York, (1991)). Ligands include compounds developed for the treatment of schizoprenia, including the antipsychotic agents clozapine, risperidone, and olanzepine, (Weil-Malherbe, H., Serotonin and schizophrenia. In “The Central Nervous System. Vol. 3, Serotonin in Health and Disease”, Essman, W. B., Ed, Spectrum Publications, Inc., New York, (1978), pp. 231-291). Ligands associated with the treatment of eating disorders can be used, such as the SSRIs and fenfluramine. Fenfluramine may be useful in the treatment of other diseases, such as autism, premenstrual syndrome, seasonal affective disorder, and attention deficit disorder. Ligands associated with alleviation of gastrointestinal disorders can be used, such as ondansetron and granisetron, which are used in the treatment of radiation induced emesis associated with cancer chemotherapy, and for ameliorating the nausea and vomiting occurring during recovery from general anesthesia. Other ligands include metoclopramide and cisapride. Ligands used in control of the sleep-wakefulness cycle, such as L-tryptophan or nonselective 5-HT agonists or 5-HT antagonists such as ritanserin may be used (for a review, see Wauquier, A., and Dugovic, C., Ann N.Y. Acad. Sci., (1990), vol. 600, pp. 447-459). Other ligands include etanserin, a 5-HT2 receptor antagonist used as an antihypertensive agent. The sulfhydryl moiety, with the thiolate ion as the active species, is the most reactive functional group in a protein. With a pK a of about 8.6, the reactivity of the thiol is expected to increase with increasing pH, toward and above its pKa. Maleimides are considered fairly specific to the sulflhydryl group, especially at pHs below 7 where other nucleophiles are protonated. In acidic and near neutral solutions, the reaction rate with simple thiols is about 100-fold faster than with the corresponding simple amines. Although the rate increases with pH, the reaction with the amino group also becomes significant at high pHs. The other major competing reaction is the hydrolysis of maleimides to maleamic acids. However, at pH 7, the apparent rate of hydrolysis is only 3.2×10 −4 min−1 in 0.1 M sodium phosphate buffer at 20° C., which is too slow to interfere with the reaction with sulfhydryl groups. The rate of decomposition becomes significant only at pH above neutrality. Thiol undergo Michael reaction with maleimides to yield exclusively the adduct to the double bond. The resulting thioether bond is very stable and cannot be cleaved under physiological conditions. The amino group is another strong nucleophile in the protein. However, because of its abundance and omnipresence in proteins, and the relatively high pK a of the ammonium ion, most of the reagents that react with the amino group can also react with other functionalities. Thus, it may not be an ideal target for modified ligands according to the invention, unless the critical cysteine residues are absent from the drug-binding site. Nevertheless, many stable acylated products are still and only formed with the amino groups. The most common reactions of amines are alkylation and acylation reactions. Some of the important alkylating agents that can be incorporated into ligand structures are: α-haloacetyl compounds (e.g., haloacetate, haloacetamides), N-maleimide derivatives, aryl halides (e.g., dinitrofluorobenzene, trinitrobenzenesulfonate), aldehydes (e.g., glutaraldehyde, formaldehyde) and ketones (e.g., pyridoxal phosphate). Acylating agents include, but are not restricted to, isocyanate, isothiocyanate, imidoesters, N-hydroyxlsuccinimidyl ester, ρ-nitrophenyl ester, acyl chloride, and sulfonyl chloride. The reporter molecule may be selected from a group including a chromogen, a chromophore, a catalyst, an enzyme, a fluorochrome, a chemiluminescent molecule, a lanthanide ion such as Europium (Eu 34), a radioisotope, a spin label, and a direct visual label. Preferably, the reporter molecule is a radioisotope such as  3H, 125I, 14C, 32P, 33P, and 35S. Previous studies of the es nucleoside transporter system (Paterson et al. (1977),  Mol. Pharmacol., vol. 13, pp. 114; Gati et al. (1983), Mol. Pharmacol., vol. 23, pp. 146-1520) suggested that the sugar component of nucleosides was important for binding of a nucleoside to the es nucleoside transporter site. Thus in the present invention, that linker moiety was attached to the pyrimidine/purine ring of the nucleosides to avoid destruction of effective inhibition for the es nucleoside transporter to provide novel probes for that transporter regulatory site. To demonstrate the sensitivity of es and ei nucleoside transport systems to NEM, various mammalian cell lines were treated with varying concentrations of NEM from 0 to 30 mM for 1 min prior transport assay. FIG. 1 shows the equilibrative transport (measured at 5 s uptake interval) of  3H-uridine (final concentration 50 μM) in murine myeloma SP2/0-Ag14 cells was inhibited by NEM in an apparent biphasic manner. About 60-70% of the transport activity was inhibited by NEM with IC50 value of 0.15 mM. The remaining 30-40% of transport activity was gradually abolished by NEM at concentrations above 3 mM. Similar biphasic inhibition by NEM was also observed in human HL-60 and human MCF-7 cells, which possess both the es and ei transport systems (Lee et aL (1995), Biochim. Biophys. Acta, vol. 1268, pp. 200-208). For cells that possess only es (murine EL-4 cells) or only ei (rat Morris 7777) transport system, monophasic 3H-uridine transport curves in NEM dose-response experiments were observed. The IC50 values were approximately 0.1 and 1.5 mM for EL-4 and Morris 7777 cells, respectively. These results suggested that the biphasic curve of total 3H-uridine transport observed in NEM dose-response experiments is a reflection of the presence of two distinct equilibrative nucleoside transport systems in those cells. The NEM-sensitive component is the es transport system and the NEM-insensitive component is the ei transport system. The ei transporter, although less sensitive to NEM inhibition, can be inhibited at higher concentrations of NEM or by prolonged exposure to NEM. This observation is in agreement with the general notion that sulfhydryl groups of enzymes display a considerable variation in their reactivity, ranging from unreactive, through several stages of sluggishness, to free and being immediately reactive. To further demonstrate that the reduction in uridine influx by es transport system is due to NEM-induced chemical modification on the carrier protein which subsequently affected the transport affinity, and to confirm the notion that the changes in es nucleoside transport activity can be demonstrated by changes in  3H-NBMPR binding ability, murine myeloma SP2/0-Ag14 cells pretreated with or without 0.3 mM NEM for 1 min were assayed for the availability of high-affinity 3H-NBMPR binding sites on the cell membranes. FIG. 2 shows that the Kd value (corrected for non-specific binding determined in the presence of 20 μM of NBTGR) for 3H-NBMPR binding was changed significantly in response to NEM treatment. Shortly after 1 min of NEM exposure, the apparent Kd value was 1.9±0.4 nM, as compared to 0.16±0.02 nM for untreated cells. However, the Bmax values of 40,000±2,600 and 41,000±1,000 sites/cell for NEM treated and untreated cells, respectively, were not significantly different. These results provide additional evidence that a critical disulfhydryl bond is located near or close to the nucleoside transporting/binding site of the es transport system, where formation of disulfhydryl bond with NEM affects the transport affinity of the carrier. The suggestion that the critical sulfhydryl group on the es transporter protein is probably located or close to but not on the nucleoside transporting/binding site is derived from the observations that NBMPR, dilazep, dipyridamole at 30 μM and uridine at 10 mM were incapable of protecting this sulffiydryl group from NEM modification (Lee et al. (1995), Biochim. Biophys. Acta, vol. 1268, pp. 200-208). Although NEM is effective as an inhibitor of es transporter protein, it is toxic and should be modified for therapeutic purposes. The strategy to selectively irreversibly inhibit the es transporter protein is to attach a reactive group specific covalent binding agent (maleimide) to a driver so that it can deliver the covalent binding agent to the desired target. The most suitable driver will be the physiological ligand itself (nucleoside). Cytidine, a pyrimidine nucleoside, is selected among other physiological nucleosides due to its “function inertness”, thus minimizes “non-specific” drug binding. As for the spacer arm that links the maleimide to the cytidine, a cyclohexane carboxylic acid is chosen for pilot studies. This configuration is to mimic the chemical structure of NBMPR (FIG. 5 b). Furthermore, other advantages like hydrophobicity provided by cyclohexane) and stability (provided by carboxylic acid) are also taking into consideration. N-Succinimidyl 4-[N-maleimidomethyl]cyclohexane-1-carboxylate (SMCC) and cytidine were dissolved in anhydrous dimethysulfoxide (DMSO) separately prior reaction. The reaction started when these two reagents were mixed at room temperature and shielded from light. The molar concentration ratio of SMCC:cytidine in the mixture was 0.10 M:0.15 M with pH 7.5-8.0 in the reaction system. Within 4 hrs, CrMCC was found in the reaction mixture and can be separated from cytidine and SMCC by a C 18 reversed-phase column (Resource RPC, Pharmacia) operated on a HPLC (AKTA Purifier, Pharmacia) using the absorbance wavelength of 300 nm. Cytidine was eluted by 100% water and CrMCC and SMCC were eluted by 15% acetonitrile in water with the flow rate 1.5 ml/min. The hydrophobicity of CrMCC is greater than that of cytidine but is less than that of SMCC. Formation of CrMCC reached its near maximum after 48 hrs of reaction between SMCC and cytidine at 22-24° C. (FIG. 4). The area under the peak was calculated using a computer program UNICORN (version 2.0). HPLC purified CrMCC was lyophilized by freeze-drying. The activity of CrMCC was stable for at least three months if it was stored at −20° C. in a desiccator. The molecular weight of CrMCC was determined by LC-MS (Waters). Briefly, CrMCC was eluted out of a C 18 reversed-phase column (Resource RPC, Pharmacia) by 20% acetonitrile in water at a flow-rate of 3 ml/min. The capillary voltage of micromass mass spectrometer was set to 3.0-3.5 V, and the cone voltage was set at 20 V. N2 gas flow was at 700 L/hr and electrospray was negative. Mass spectra were gathered under a full-scan operation, scanning range 1-1000 m/z. The molecular weight of CrMCC was determined by monitoring the protonated molecular ion, and was similar to the predicted value of 462.5. The purity of CrMCC synthesized was consistently greater than 95%. The light absorbance spectrum of CrMCC was measured by uv-vis spectrophotometer. FIG. 5A shows there are two λ max's for the light absorbance spectrum of CrMCC. One of them is at 254 nm (similar to the λmax of cytidine) and the other one is at 300 nm (similar to the λmax of SMCC). Such an absorbance profile of CrMCC with two λmax's is very similar to that of NBMPR (FIG. 5B). This indicated that CrMCC consists of both pyrimidine and cyclohexane rings on its chemical structure. Subsequent structural studies using NMR confirmed this finding. 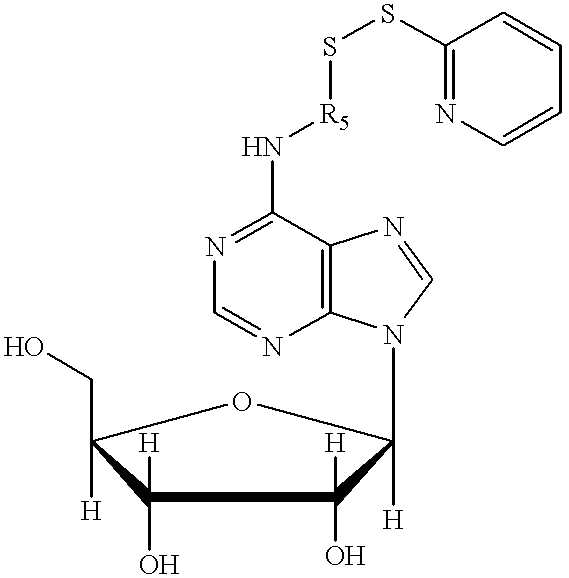 To synthesize  3H-CrMCC, radioactive cytidine (3H-cytidine) was used. Since high concentration of substrate increases the yield of CrMCC, nonradioactive cytidine was pre-mixed with radioactive 3H-cytidine at a concentration ratio of 100:1 prior to reaction with SMCC (see Example 2). Purified HL-60 plasma membranes suspended in reaction buffer (0.13 M NaCl, 0.02 M NaHCO 3, pH 7.0) were pretreated with graded concentrations of cytidine, SMCC, and CrMCC for 5 min prior exposed to 3H-NBMPR (5 μM) for additional 30 min. The reaction was terminated by membrane filtration method (Lee & Jarvis (1988), Biochem. J., vol 249, pp. 557-564). The data shown in FIG. 6 were corrected for non-specific binding determined in the presence of 20 μM of NBTGR. FIG. 6 shows the specific of 3H-NBMPR to HL-60 unsealed plasma membranes was inhibited by CrMCC with IC50 value of 10 μM. In contrast, the IC50 values for SMCC and cytidine in inhibiting 3H-NBMPR binding were 100 μM and >1 mM, respectively. The Ki value for CrMCC was calculated to be 1 μM. To analyse the effect of CrMCC on the binding kinetics of  3H-NBMPR, purified HL-60 plasma membranes were pretreated with 0, 10, and 50 μM of CrMCC for 5 min prior incubated with graded concentrations of 3H-NBMPR (0.2 to 8 nM) for additional 30 min. A double reciprocal plot of the results is presented in FIG. 7. The lines of the plots were intersected at the abscissa indicating a changed value for Bmax but an unchanged value for Kd in the presence of CrMCC. For the data shown, the apparent Kd values of 3H-NBMPR binding were 0.36±0.04, 0.31±0.03 and 0.39±0.05 nM with Bmax values of 1.56±0.05, 0.59±0.01 and 0.30±0.01 pmol/mg protein for membranes treated with 0, 10 and 50 μM of CrMCC, respectively. Data were corrected for non-specific binding determined in the presence of 20 μM of nitrobenzylthioguanosine (NBTGR), a non-radioactive competitive ligand. These results suggested a non-competitive inhibition of 3H-NBMPR binding by CrMCC. This is a unique feature of the irreversible antagonism. The availability of radioactive CrMCC ( 3H-CrMCC) makes it possible to study the biochemical properties of CrMCC on the es nucleoside transporter. This experiment was conducted to investigate the rate of 3H-CrMCC binding to the unsealed plasma membranes of HL-60 cells. FIG. 9 shows the binding of 3H-CrMCC (30 μM final concentration) to purified HL-60 plasma membranes was rather slowed. A minimum of 5 min is needed to achieve the maximum binding value of 12 nmoles per mg of HL-60 plasma membrane protein. This is unlike the binding of reversible antagonists such as NBMPR, dipyridamole and dilazep, which the binding was known to be rapid and mostly completed within first minute of incubation. The binding reaction in FIG. 9 was terminated by membrane filtration method and the data were corrected for filter blanks. It is important to confirm the binding of  3H-CrMCC to the unsealed HL-60 plasma membranes is indeed irreversible. Purified unsealed HL-60 plasma membranes were incubated with 30 μM of 3H-CrMCC for 10 min. After which the mixtures were diluted 20 folds and the diluted mixtures were sat at room temperature for various time intervals to allow dissociation to occur. FIG. 10 shows little or no dissociation of 3H-CrMCC from its binding sites occurred for at least 60 min after a 20-fold dilution. 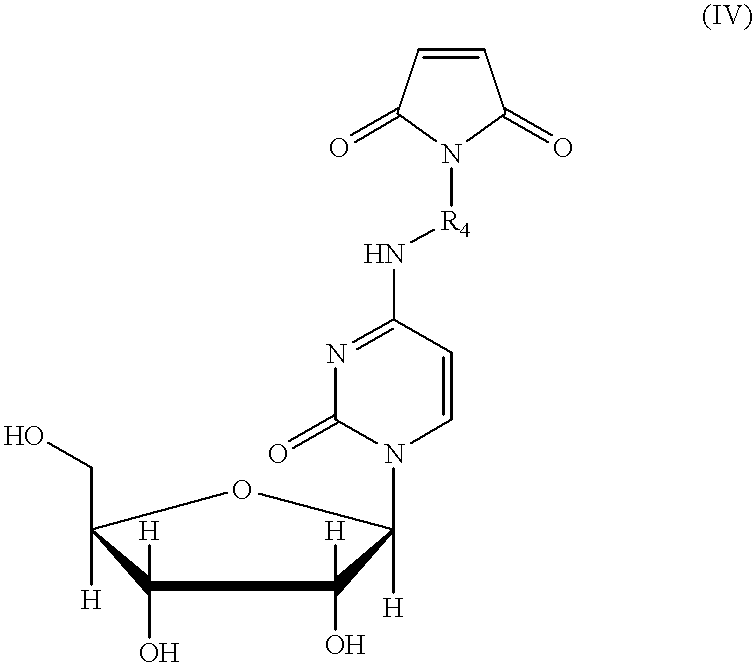 Even 1 mM of cytidine presence in the dilution medium failed to displace 3H-CrMCC from its binding sites. In contrast, the binding of 30 μM of 3H-cytidine to HL-60 plasma membranes was low and dissociated rapidly and completely upon dilution (inset of FIG. 10). This finding together with the non-competitive inhibition of 3H-NBMPR binding by CrMCC (FIG. 7) suggested the interaction of CrMCC to its binding sites is indeed irreversible. The dissociation reaction shown in FIG. 10 was terminated by membrane filtration method and the data were corrected for filter blanks. To determine the concentration dependence of 3H-CrMCC binding to its binding sites, purified unsealed HL-60 plasma membranes were incubated with graded concentration of 3H-CrMCC (3 to 800 μM) for 10 min and the reaction was terminated by membrane filtration method (FIG. 11). The data can be resolved into at least two components, a high affinity component (Kd=23.8±2.2 μM) and a low affinity component (inset of FIG. 11). The kinetic constants for the low affinity component cannot be estimated with the existing concentration range of 3H-CrMCC. It is also possible that this low affinity component is a non-specific 3H-CrMCC binding site. The data shown in FIG. 11 were corrected for filter blanks. It is important to determine the stability of  3H-CrMCC-receptor complexes in various pH conditions. Purified unsealed HL-60 plasma membranes were incubated with 30 μM of 3H-CrMCC for 5 min. The reaction mixture was then diluted 20-fold with reaction buffer of various pH values (pH 0.85 to 7.5). The dissociation reaction was terminated by membrane filtration method. The data were corrected for filter blanks. FIG. 12 shows 3H-CrMCC-receptor complexes were very stable at physiological pH. However, the ligand-receptor complexes began to break down at pH below 3.5. Early studies with sulfhydryl reagent NEM had suggested that a cysteine residue is probably situated very close to but not on the nucleoside transporting/binding site of the es nucleoside transporter protein. Thus, if  3H-CrMCC is bind to the same site that NEM binds, then the substrates that failed to inhibit NEM action (Lee et al. (1995), Biochim. Biophys. Acta, vol. 1268, pp. 200-208) should similarly have little or no effect on 3H-CrMCC binding. FIG. 13 shows 1 mM of physiological nucleosides (e.g. cytidine, uridine, adenosine and inosine), and 20 μM of es nucleoside transport inhibitors (e.g. NBMPR and dipyridamole) indeed failed to inhibit the binding of 3H-CrMCC (30 μM final concentration) to the HL-60 plasma membranes. In contrast, 1 mM of NEM was as effective as 0.5 mM of CrMCC in inhibiting the binding of 3H-CrMCC. This finding suggested that NEM and CrMCC reacted to the same sulfhydryl group on the es nucleoside transporter protein. It was successfully demonstrated that maleimide, a sulfhydryl group reactive agent, linked to cytidine via a cyclohexane carboxylic acid spacer arm is effective in irreversibly inhibiting the binding of  3H-NBMPR to the es transporter protein. In this experiment, the binding capability of 3H-cytidine molecule to the HL-60 plasma membranes after being linked to the same or different sulfhydryl group reactive agent via different spacer arms was compared, to provide an indirect indication on the suitability of the spacer arms used in creating the irreversible es nucleoside transport inhibitor. Thus, 3H-cytidine was chemically modified to incorporate various sulfhydryl reactive side arms onto the 6-amino position of the pyrimidine ring. Chemicals used to modify 3H-cytidine include m-maleimidobenzoyl-N-hydroxysuccinimide (MBS), N-succinimidyl 4-[p-maleimidophenyl]butyrate (SMPB), N-[γ-maleimidobutyryloxy]succinimide, 4-suceinimidyloxycarbonyl-α-methyl-α-[2-pyridylthio]toluene (SMPT), N-succinimidyl 3-[2-pyridyldithio] propionate (SPDP), N-succinimidyl maleimidoacetate (AMAS), and N-[ε-maleimidocaproyloxy]succinimide (EMCS ), in addition to N-succinimidyl 4-(N-maleimidomethyl)cyclohexane-1-carboxylate (SMCC). 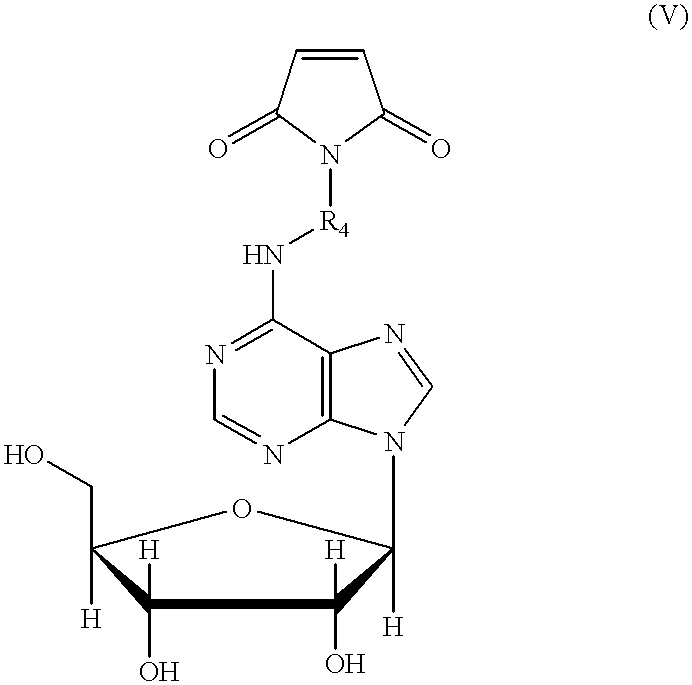 Purified HL-60 plasma membranes were incubated with 100 μM of these chemically modified 3H-cytidine analogs for 5 min. The reaction was terminated by membrane filtration method. FIG. 14 shows N-α-maleimidoacetoxylic acid (AMA) covalent arm promotes highest irreversible binding of 3H-cytidine to the HL-60 plasma membranes followed by 3-[2-pyridyldithio]propionic acid (PDP) However, N-ε-maleimidocaproylic acid (EMC), m-maleimidobenzoic acid (MB), N γ-maleimidobutyrylic acid (GMB) and 4-[p-maleimidophenyl]butyrylic acid (MPB) were equally effective as covalent arms as compare to N-maleimidomethyl cyclohexane carboxylic acid (MCC). In contrast, α-methyl-α-[2-pyridyldithio]toluene carbonic acid (MPT) was least effective. Symbol X in FIG. 14 represents cytidine. Attempts were made to identify the plasma membrane proteins that were labelled by  3H-CrMCC. 3H-CrMCC (20 μM) labelled HL-60 plasma membrane proteins solubilized in SDS were loaded onto a C18 reversed-phase column (Resource RPC, Pharmacia) operated on a FPLC (ATKA FPLC, Pharmacia) with the following conditions: column volume (CV, 3 ml), starting buffer A (0.05% TFA in water), eluent B (0.065% TFA in acetonitrile), flow rate (2 ml/min), detection (280 nm), elution (0% B in 3 CV, 0-5% B in 1 CV, 5% B in 5 CV, 5-100% B in 15 CV, wash-out 100% B). FIG. 15 shows the general UV (λ=280 nm) absorbance profile of HL-60 plasma membranes after being separated by FPLC using a C18 reversed-phase column. The arrows on the chromatogram indicate the protein peaks that were labelled by 3H-CrMCC (refer to FIG. 16). The eluents were collected at 1 mmin and the radioactivity was determined by a liquid scintillation counter. FIG. 16 shows there are at least three major radioactive peaks located at fraction numbers 43-44, 49-50, and 57-59 of the chromatogram. The sharp radioactive peak at fraction number 6 is due to degradation product of 3H-CrMCC (i.e. 3H-cytidine) and the non-specific binding of 3H-CrMCC to the membrane lipids. In view of the success of creating irreversible inhibitor of es transporter protein using cytidine as a lead compound, reproduction of the invention can be implemented by attaching a covalent arm to other physiological nucleosides such as adenosine (FIG. 17). 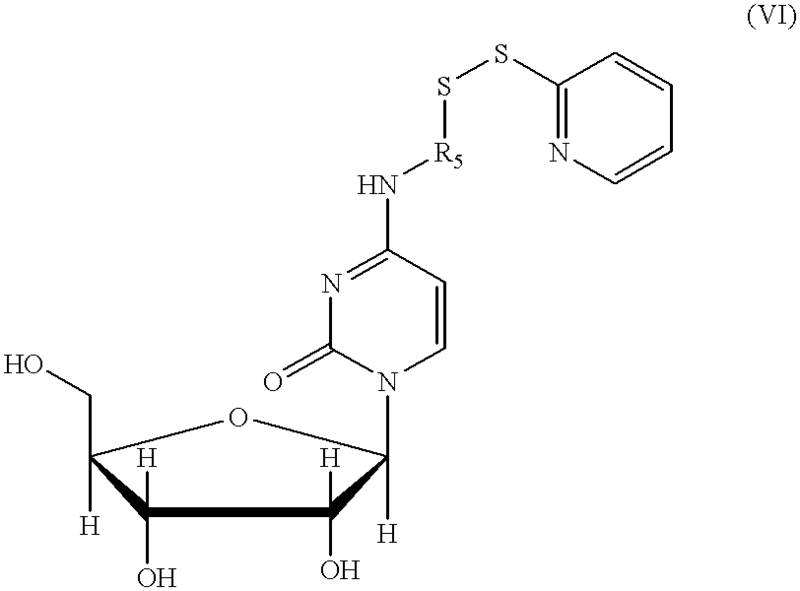 3H-Adenosine was chemically modified to incorporate various sulfhydryl reactive covalent arms onto the 6-amino position of the purine ring according to the general procedure set out in FIG. 3, and using the chemicals listed in Example 5. HL-60 plasma membranes were incubated with 100 μM of these chemically modified 3H-adenosine analogs for 5 min. The reaction was terminated by membrane filtration method. FIG. 17 shows 4-[p-maleimidophenyl]butyrylic acid (MPB) covalent arm promotes highest irreversible binding of 3H-adenosine (100 μM) to the HL-60 plasma membranes followed by N-α-maleimidoacetic acid (AMA). However, 3-[2-pyridyldithio]-propionic acid (PDP), N-ε-maleimidocaproylic acid (EMC), m-maleimidobenzoic acid (MB), and N-maleimidomethyl cyclohexane carboxylic acid (MCC) were equally lesser effective as covalent arms. In contrast, N-γ-maleimidobutyrylic acid (GMB) and α-methyl-α-[2-pyridyldithio]toluene carbonic acid (MPT) were least effective. The compounds shown in FIGS. 19 a, 20 a, 21 a and 22 a (chemical structures of LBT3001 (1-[2-(5-hydroxy-1H-indol-3-yl)-ethyl]-pyrrole-2,5-dione), LBT3002 (4-(2,5-dioxo-2,5-dihydro-pyrrol-1-yl)-N-[2-(5-hydroxyl-lH-indol-3-yl)-ethyl]-butyramide), LBT3004 (3-(2,5-dioxo-2,5-dihydro-pyrrol-1-yl)-N-[2-(5-hydroxyl-1H-indol-3-yl)-ethyl]-propionamide), and LBT3005 (4-(2,5-dioxo-2,5-dihydro-pyrrol-1-yl-methyl)-cyclohexane carboxylic acid [2-(5-hydroxy-1H-indol-3-yl)-ethyl]-amide), respectively) demonstrated efficacy as irreversible binding compounds, and provide examples of modified ligands which are modified 5-HT receptor binding ligands comprising conjugation agents. The reaction scheme for synthesis of LBT3001 (FIG. 19 b) is as follows: 5-Hydroxytryptamine (212.7 mg, 1.0 mmol) was dissolved in saturated sodium bicarbonate (25 ml) solution at 0° C. N-Ethoxycarbonyleimide (177.6 mg, 1.05 mmol) was added under stirring. After 30 minutes, the ice-water bath was replaced with warm water bath (30° C. to 40° C.). The reaction solution was then stirred in the warm water bath for about one hour. The solution was then extracted with ethyl acetate (3×50 ml). The ethyl acetate layer was then washed with deionized water until pH close to neutral (2×20 ml) and then with brine (20 ml). The organic layer was then dried with anhydrous MgSO4. The solvent was removed under reduced pressure to obtain a crude product in yellow oil. Purification through flash chromatography (30% ethyl acetate in hexane) afforded the product as a yellow to orange crystal (187.2 mg, 73%). The reaction scheme for synthesis of LBT3002 (FIG. 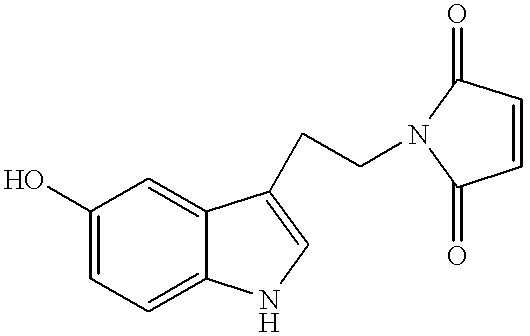 20 b) is as follows: 5-Hydroxytryptamine hydrochloride (42.5 mg, 0.2 mmol) and 3-maleimidobutyric acid (40.3 mg, 0.22 mmol) were suspended in 1 ml 2-methoxyethyl ether (DME). To the solution, N-methyl morpholine (NMM, 25 μl, 0.22 mmol) and 1,3-dicyclohexylcarbodiimide (DCC, 45.4 mg, 0.22 mmol) were added. The solution was stirred for 3 hours at the room temperature. The product was purified by flash chromatography directly using a gradient solvent eluent (0% to 3% methanol in methylene chloride) to generate brownish oil (40.7 mg, 60%). The reaction scheme for synthesis of LBT3004 (FIG. 21 b) is as follow: 5-Hydroxytryptamine hydrochloride (42.5 mg, 0.2 mmol) and 3-maleimidopropionic acid (37.2 mg, 0.22 mmol) were suspended in 1 ml methoxyethyl ether (DME). To the solution, N-methyl morpholine (NMM, 25 μl, 0.22 mmol) and 1,3-dicyclohexylcarbodiimide (DCC, 45.4 mg, 0.22 mmol) were added. The solution was stirred for 3 hours at the room temperature. The product was purified by flash chromatography directly using a gradient solvent eluent (0% to 1.5% to 5% methanol in methylene chloride) to generate an orange crystal (46.0 mg, 70%). The reaction scheme for synthesis of LBT3005 (FIG. 22b) is as follow: 4-Aminomethyl-cyclohexanecarboxylic acid (2.83 g, 18.0 mmol) in saturated NaHCO3 (80 ml) was stirred vigorously at 0° C. To the solution, N-ethoxycarbonyleimide (finely grounded, 3.05 g, 18.0 mmol) was added portion by portion. When the addition was completed (c.a. 10 minutes), deionized water (80 ml) was added and the mixture was stirred at room temperature for 40 minutes. The resulting mixture was bought to pH 1-2 with 1 M of HCl and extracted with ethyl acetate (3×80 ml). The organic layer was washed with deionized water (50 ml) and then brine (20 ml). The organic phase was dried over magnesium sulfate and evaporated under reduced pressure to generate a crude product. Purification by flash chromatography (hexane: ethyl acetate : acetic acid, 60: 39: 1) to afford the product as a solid (2.69 g, 63%). 5-Hydroxytryptamine hydrochloride (42.5 mg, 0.2 mmol) and maleimidomethyl-cyclohexane carboxylic acid (52.2 mg, 0.22 mmol) were suspended in 1 ml methoxyethyl ether (DME). To the solution, N-methyl morpholine (NMM, 25 μl, 0.22 mmol) and 1,3-dicyclohexylcarbodiimide (DCC, 45.4 mg, 0.22 mmol) were added. The solution was stirred for 3 hours at the room temperature. The product was purified by flash chromatography directly using a gradient solvent eluent (ethyl acetate: hexane (1:1) to ethyl acetate: hexane (3:1)) to generate a light brown oil (28.3 mg, 35.8%). Other 5-HT receptor binding compounds such as those shown in FIG. 23 can be similarly modified for irreversible binding to their target sites using one of the reaction schemes illustrated in FIGS. 19 b to 22 b. FIG. 18 shows the inhibitory effects of various 5-HT analogs on the high affinity binding of  3H-5-HT to murine brain membranes. Purified murine brain membranes suspended in reaction buffer (0.13 M NaCl, 0.02 M NaHCO3, pH 7.0) were pretreated with graded concentrations of LBT3001 (▪), LBT3002 (□), LBT3004 (∘), and LBT3005 () for 5 min prior exposure to 3H-5-HT (5 nM final concentration) for additional 30 min. The reaction was terminated by membrane vacuum filtration method. The data shown were corrected for non-specific binding determined in the presence of 1 mM of non-radioactive 5-HT. The results were plotted against control binding determined in the absence of inhibitors. FIG. 18 shows the binding of  3H-5-HT to murine brain membranes was inhibited by all analogs of 5-HT in an apparent biphasic manner. LBT3001 (1-[2-(5-hydroxy-1H-indol-3-yl)-ethyl]-pyrrole-2,5-dione), an analog containing no spacer arm between the 5-HT and the maleimide molecules (FIG. 19 a), effectively inhibited the binding of 3H-5-HT to its high and low affinity binding sites with IC50 values of about 0.001 and 50 μM, respectively. LBT3002, an analog containing 3 carbon molecules in the spacer arm (FIG. 20a), inhibited the binding of 3H-5-HT to its high and low affinity binding sites with IC50 values of about 0.00003 and 200 μM, respectively. LBT3004, an analog containing 2 carbon molecules in the spacer arm (FIG. 21a), inhibited the binding of 3H-5-HT to its high and low affinity binding sites with IC50 values of about 0.2 and 50 μM, respectively. LBT3005, an analog containing cyclohexane carboxylic molecule in the spacer arm (FIG. 22a), inhibited the binding of 3H-5-HT to its high and low affinity binding sites with IC50 values of 0.5 and 300 μM, respectively. These results clearly indicate irreversible binding drugs can be designed using the technology described. Additionally, the technology is applicable to many small molecules and can be applied to further improve the efficacy of existing molecules. 1. A process for modifying a parent ligand, comprising attaching to said parent ligand a conjugation agent that is reactive with a moiety of a target receptor to which said parent ligand binds, wherein when said parent ligand binds to the receptor a covalent bond is formed between said conjugation agent and said moiety, and wherein the parent ligand binds specifically with a nucleoside transporter. 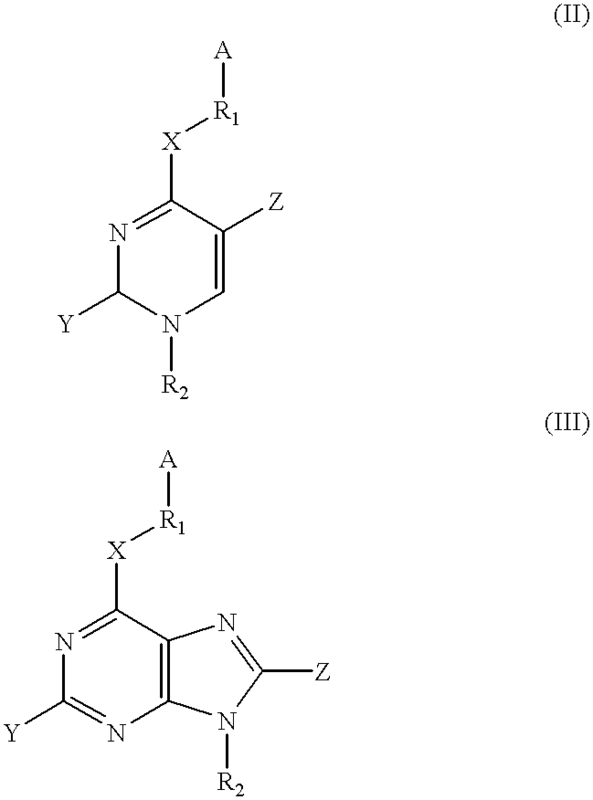 , wherein the conjugation agent is attached to the parent ligand through a spacer. , wherein the spacer comprises a group selected from the group consisting of alkyl, heteroalkyl, cycloalkyl, heterocycloalkyl, oxoalkyl, heterooxoalkyl, alkenyl, hetero alkenyl, aralkyl, hetero aralkyl, aryl and heteroaryl radicals. , wherein the conjugation agent is selected from the group consisting of a sulfhydryl group specific conjugation agent, an amino group specific conjugation agent, a carboxyl group specific conjugation agent, a tyrosine specific conjugation agent, an arginine specific conjugation agent, a histidine specific conjugation agent, a methionine specific conjugation agent, a tryptophan specific conjugation agent, and a serine specific conjugation agent. , wherein the conjugation agent is a sulfhydryl group specific conjugation agent selected from the group consisting of N-maleimide and N-maleimide derivatives. , wherein the N-maleimide derivatives are selected from the group consisting of disulfide reagents including 5′-dithiobis-(2-nitrobenzoic acid), 4,4′-dithiodipyridine, methyl-3-nitro-2-pyridyl disulfide, and methyl-2-pyridyl disulfide. , wherein the conjugation agent is selected from the group consisting of alkylating agents and acylating agents. 8. A process for modifying a parent ligand, comprising attaching to said parent ligand a sulfhydryl group specific conjugation agent that is reactive with a sulfhydryl group of a target receptor to which said parent ligand binds, wherein when said parent ligand binds to the receptor a covalent bond is formed between said conjugation agent and said sulfhydryl group, and wherein the parent ligand binds specifically with a serotonin receptor. R1 is an optional spacer. , wherein the spacer comprises a non-hydrolysable radical selected from the group consisting of alkyl, heteroalkyl, cycloalkyl, heterocycloalkyl, oxoalkyl, heterooxoalkyl, alkenyl, hetero alkenyl, aralkyl, hetero aralkyl, aryl and heteroaryl radicals. , wherein the conjugation agent is a sulfhydryl group specific conjugation agent. , wherein the sulfhydryl group specific conjugation agent is selected from the group consisting of N-maleimide and N-maleimide derivatives. , wherein the parent ligand binds specifically with an es nucleoside transporter. R2 is H, β-D-ribose, β-D-2-deoxyribose, or their 5′-mono-, 5′ di-, and 5′ tri-phosphate. wherein R5 is 4-carbonyl-α-methyl-α-toluene, 6-[α-methyl-α-tuloamido]-hexanoate, N-[3-propionate], or 6-[3 ′-propioamido]hexanoate. , wherein the parent ligand comprises serotonin or a precursor or analog thereof. and a pharmaceutically acceptable carrier. detecting the presence of a complex comprising said modified ligand and said receptor in said contacted sample. relating said measured complex concentration to the concentration of said receptor in said sample. having a reporter molecule associated therewith. in the study of target receptor function.